Is the JIVE² Platinum Tandem Pram suitable from birth/ for newborns? Can the JIVE² Platinum Tandem Second Seat recline? What is the weight limit of the JIVE² Platinum Tandem Bassinet? Up to what age will my child fit into the JIVE² Platinum Tandem? What is the weight limit of the JIVE² Platinum Second Seat? What are the JIVE² Platinum Tandem dimensions? How much does the JIVE² Platinum Tandem weigh? When should I move my child from the bassinet to the seat in my JIVE² Platinum Tandem? No, the second seat cannot recline. 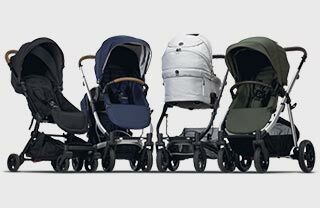 The JIVE² Platinum Tandem is one of the most compact tandem prams available on the market. To provide this unique feature, we have kept the chassis size as small and lightweight as possible. To have the second seat recline, we would have to increase the size and weight of the chassis. The second seat can carry up to 17kg (the weight of an average 4.5 year old boy) and has more head room and foot space in the basket to comfortably seat a toddler. For children over 3 that are confident standing, we also recommend our Buggyboard which can be attached to the JIVE² Platinum and JIVE² set up in the single configuration. Will the Second Seat for the Anniversary Edition, JIVE² Scenic Pram, be sold separately?